Our world is a tiny island. During my life, several races took their reign here. All civilizations come here strong, proud and full of determination to survive and settle here. But there are constantly some boats at the shores looking for opportunity and each race has only limited power at their disposal. And so it does not take long, before the mighty civilization will gradually die out and only a frightened group of survivors is left. Our world is a tiny island. Why is everyone so interested in it? I do not know. Maybe somewhere out there, a terrible war rages, that force all races to go looking for a quiet home. But they will not find it here. Everyone will die here without hope for the future .. 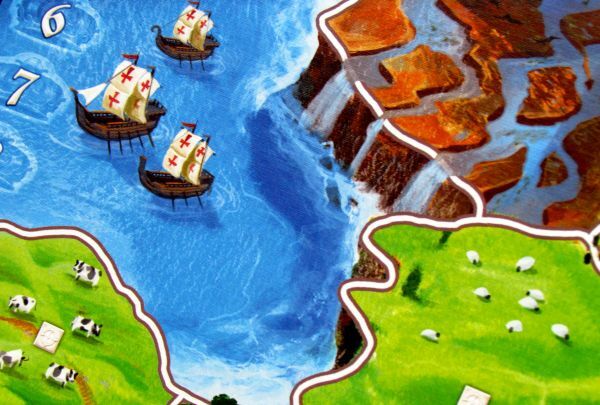 Precisely such is the philosophy of the world, that the author Phillipe Keyaertes introduces to us in his game called Small World. This game really enjoys immense popularity worldwide, and it was only a matter of time, before the game gets also on our table. We can only thank to its publishers, Days of Wonder company, for providing the review copy for us. 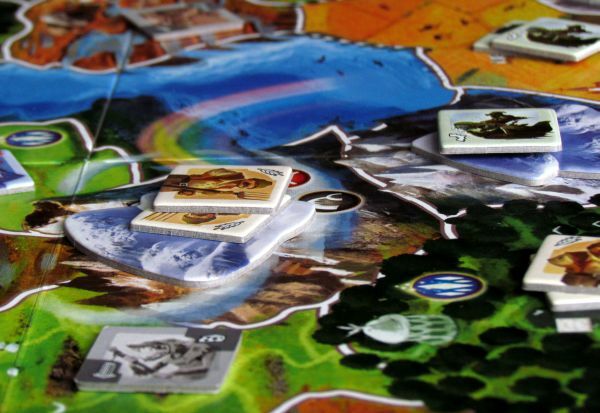 Small World was first published in 2009. Beautiful illustrations, that welcome you on the lid of the box, are work of Miguel Coimbra, who decorated even 7 Wonders (review in Czech). But the most interesting colors and surprises are waiting for you inside the box itself. Under the rules brochures in several languages, you will find two layers comprising of double-sided game plans, one square and one rectangular. 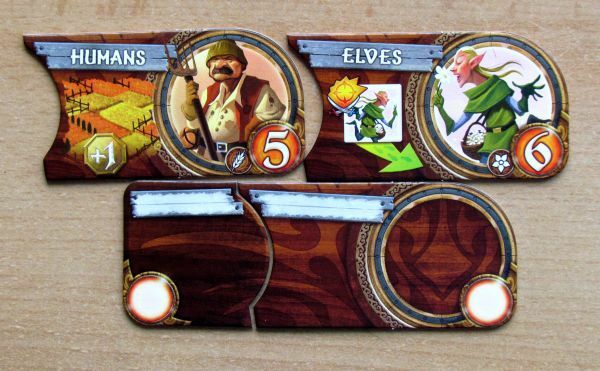 Above is a smaller one folded in half for encounters of two to three players. If you compete in more participants, you could reach for larger one a little deeper in the box. 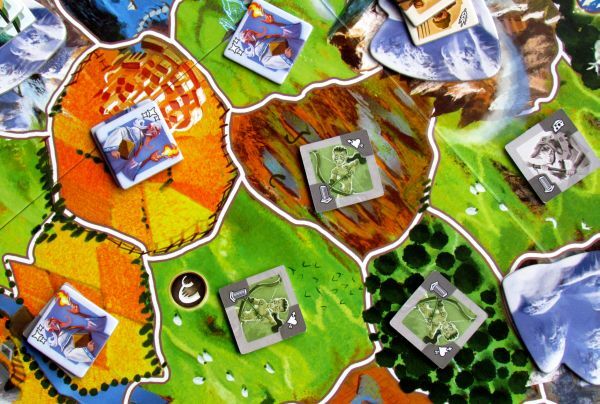 Boards are significantly different from each other with number of turns, size of the land. All of them are clearly distinguished by a number in the upper right corner. Under the plans, you should the classic sheets of waiting chips. But where are they? We have forgotten them in excitement about the game plans. So let’s go back to them. Chips make up for a really big pile when punched out. 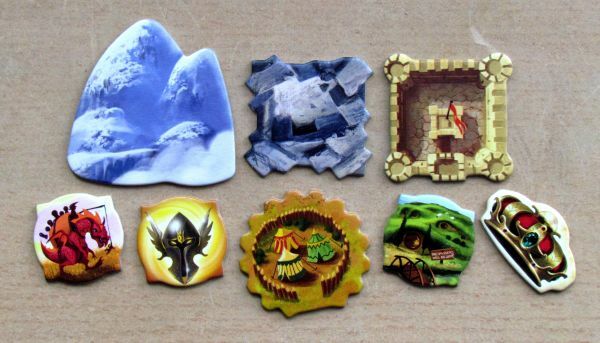 These little squares represent the races of Small World. 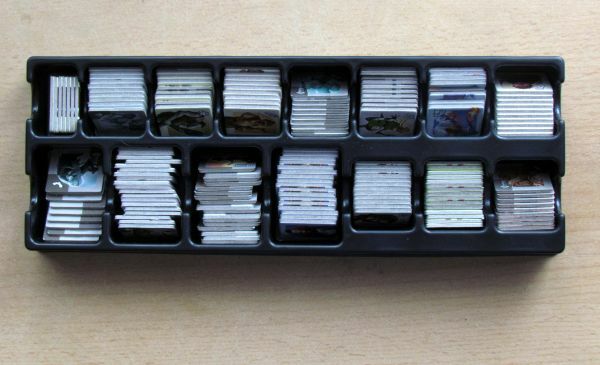 You should order these piles by type and put them in a tray provided with the game, which is portable and will also directly assist you in the game. But there are still races plates in captivity of the sheets – one for each type – and round chips of nation properties, which will together mix and provide a variable fun for you. In addition, you will find there also tokens for victory points. 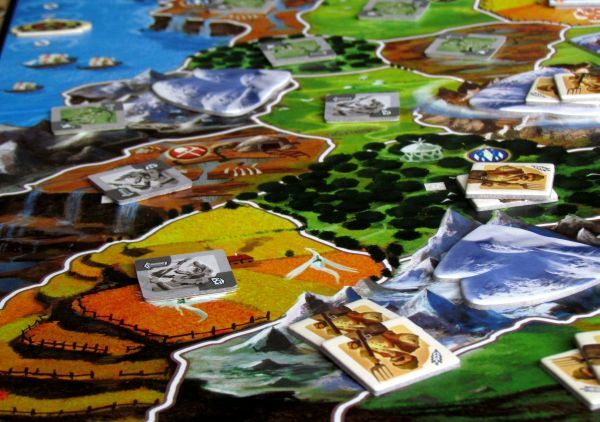 Players will receive them for control of territories, but sometimes they would pay with them. 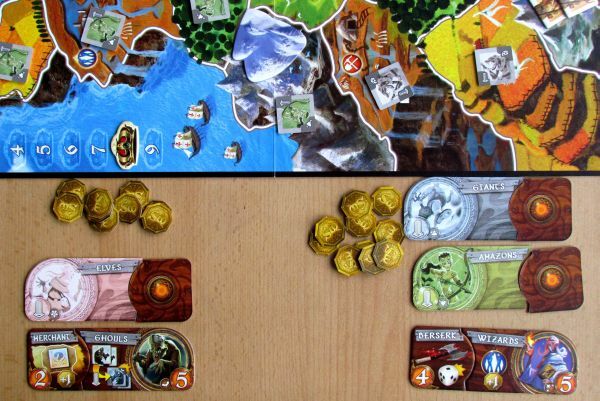 Last cardboard tokens are piles of improvements for each site – such as mountains and fortresses. 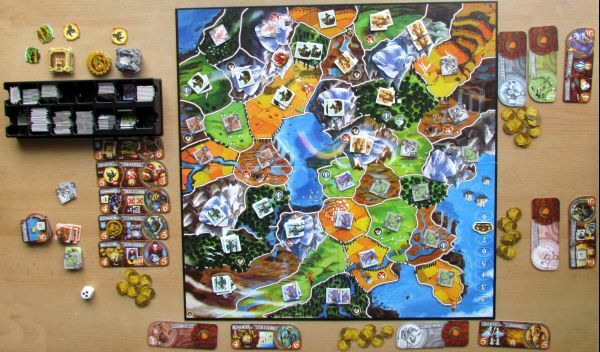 Small World is presented as a simple game for everyone and it also corresponds with really simple rules. 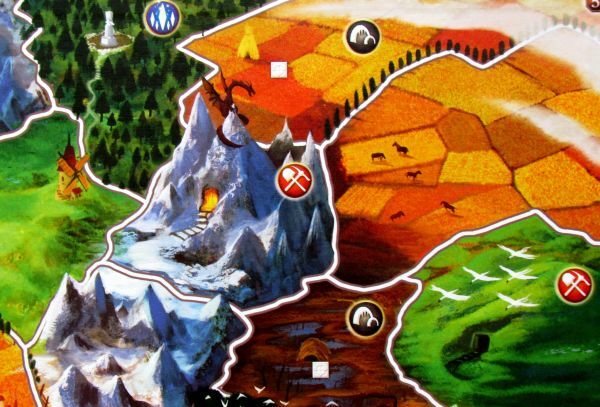 At the beginning of the game, you prepare a game plan selected by the number of players and you scatter tokens of mountains (on mountains regions) and the lost tribe on it. 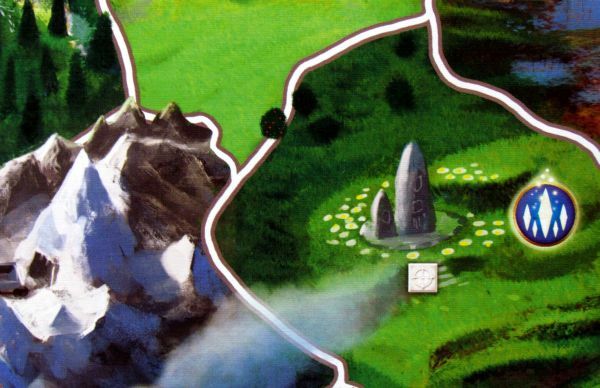 For simplicity, the sites occupied at the beginning by a lost tribe, are marked by a small icon. Preparation of the plan ends by placing the crown on the first place of moves counter. 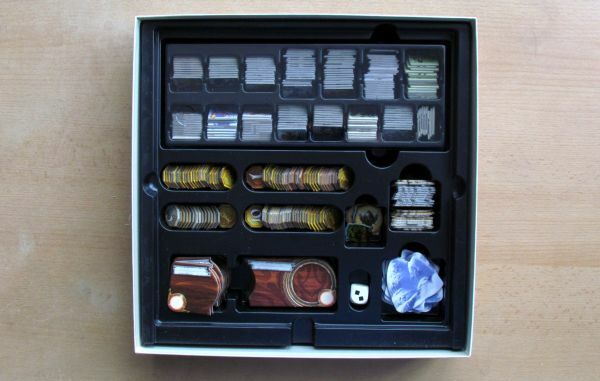 In addition to the board, you put the tray with race tokens and divide other minor cardboard components into piles. You will need to provide a special treatment only to big cards of nations and their properties. You shuffle each of them separately and put them into piles. Now you take first five of both these piles and lay them out as a starting offer. A cutting of race card is prepared for a random property token, that fits in it nicely. Together these two give you a combination of one civilization and its capabilities – such as forest dwarfs, underground skeletons or wealthy trolls. 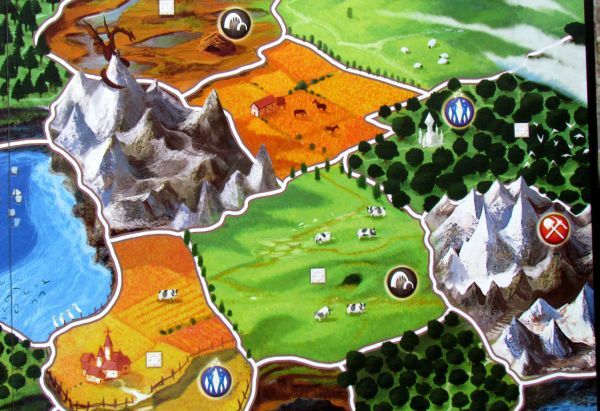 Players get only five victory points for the start, with which they must make purchase of the first nation. 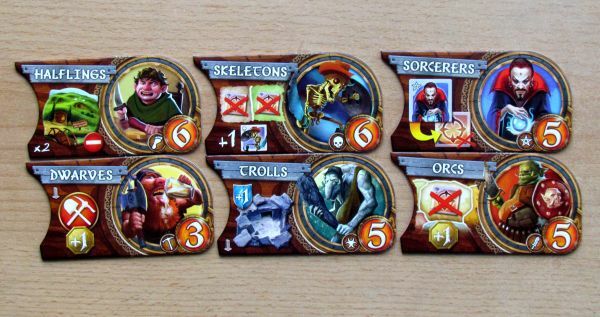 They choose in the order, in which would they play the game – turn order should be decided in favor of player with pointy ears, as indicated by the rules. The moment you choose a nation with its additional features, you take the stack of tokens for that nation from the tray. 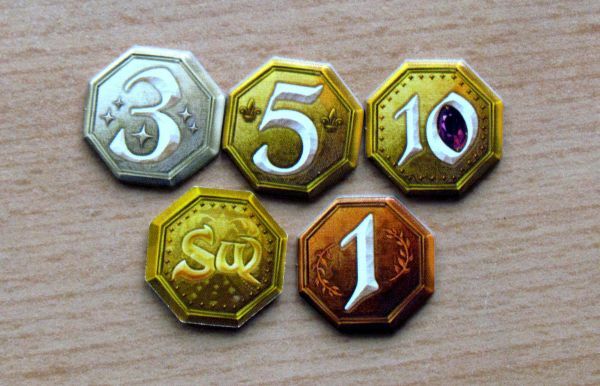 Their numbers is given by the sum of large numbers on the nation card and properties token. Usually this number will be around ten. But you cannot take more, than is available in the tray. The number of tokens corresponds to strength of the nation, so the race with stronger properties has fewer members and the like. The first round is specific – after nation’s choice, there are further actions, that await you. In subsequent turns, you can choose only one of them, as we will tell you later. 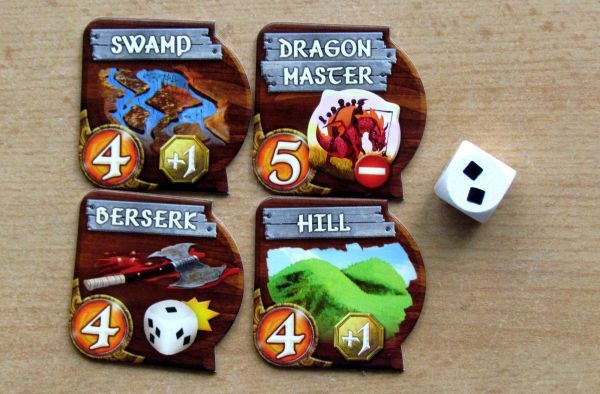 So now you can conquer land with the obtained tokens. 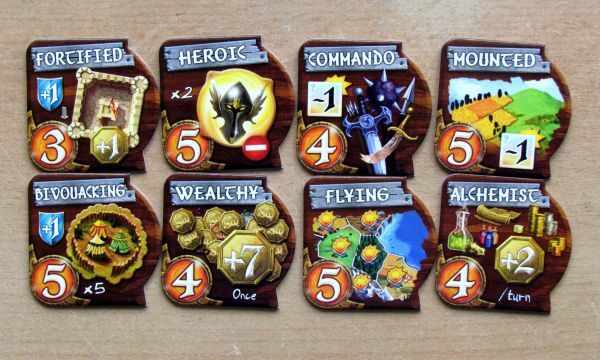 Conquest is the main entertainment, that you should expect in a match of Small World. As the new race enters map for the first time, you have to enter land from coast of your choice – any region, that is neighbouring with the sea. 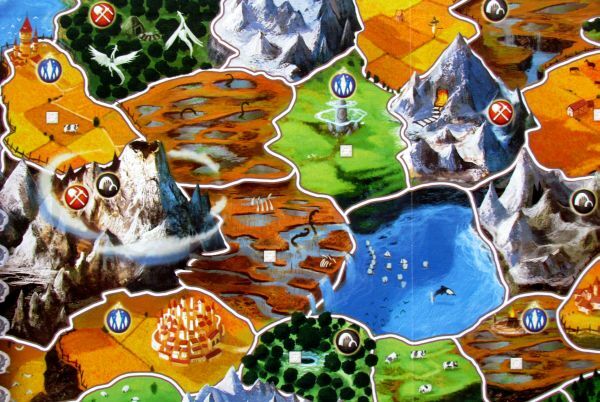 To conquer a region, you need to put at least two tokens on it, if it is not occupied. If you want to conquer a location, where already reside some units, you have to put more tokens there – one more for each present unit. So if there should be two defending wizards, you have to lay four units to successful conquest of the area. To the defense number deciding unit number must be raised for a mountain environment or a defensive fortress helping the defending troops in their fight. You can then proceed, as long as you have units in your hand. You may, of course, spread only to territory, which is adjacent to one of your previously occupied sites. If you have some tokens left over at the end of conquering phase, which would normally not be enough to conquer more territories, you can try to conquer one more with reinforcement die. Announce the location, where you lead your attack, and throw the dice. It can add up to three units to your strength. At the end of your turn, there are last two obligations waiting for you, one strategic and one very pleasant. All token units on the table can be now rearranged in a way, that they are able to resist the raids of rival races until your next turn comes. Each occupied site must have at least one chip, the upper limit is not set. You should not have any chips now, all of them must be deployed to the board. The pleasant duty is to add up all the regions, that you control. For each of them, you now get a victory point – a token from the common stock. You keep them secret from other players. Of course, conquering continues, as players take turns. 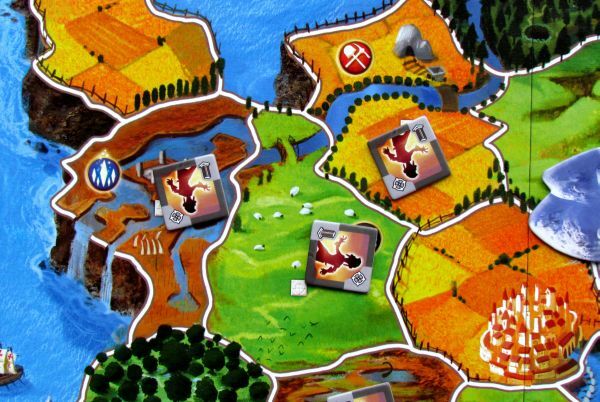 At the start of each turn, you gather all your units and use it again to conquer new regions. If someone beats your defense in a territory, he gets the control, and the defeated player must give up one troop token from there (representing the loss of troops) and his race will be weaker from now on. And as your race fades away, there is a situation approaching, when you want to replace your current race for another. You must do this exchange instead of one entire turn. Proclaim the decline of your current civilization and turn its card back side facing up. 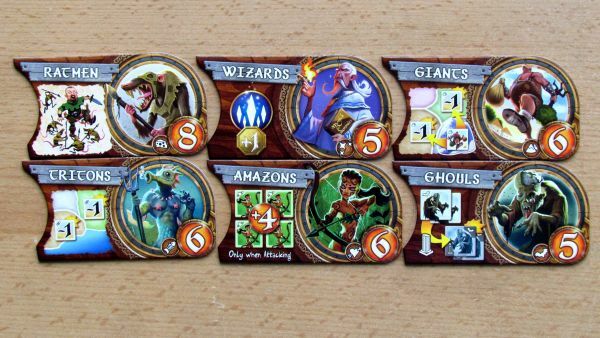 You should also adjust tokens on the board – every territory you control loses all but one token of declined race. This last token should be again facing the back side up, to make it clear, that the race is in decline. These regions will still bring profit to you, until they are occupied by different civilization. Now you choose successor from the five available new civilizations, which one suits you most. Only the top one is free of charge. If you want any of the other races in display, you must put one victory token on each race, you have jumped over. 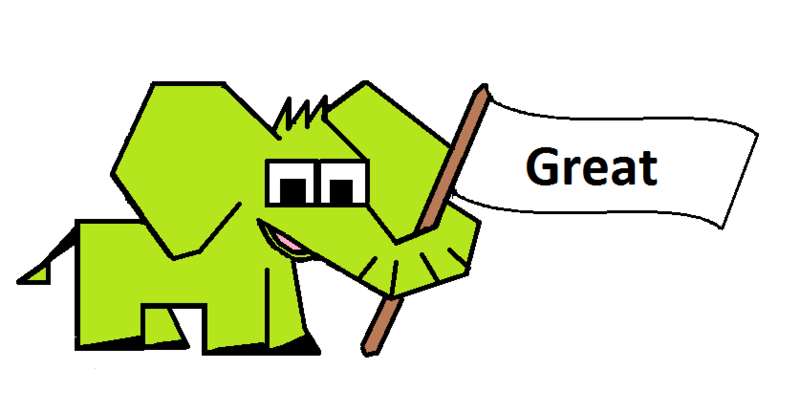 The player, who chooses this race, will get this victory point with it. Therefore you have to very well think about what you want. All races are distinguished by their skills and abilities and playing with each of them requires a different tactic. It is therefore necessary to choose race really well to suit your needs. At the beginning of each round, first player moves counter one step further. Once the crown finally hits the last of the possible positions, a last round starts. At the end of it, all players add up their victory points gathered and player with the highest profit is the winner. 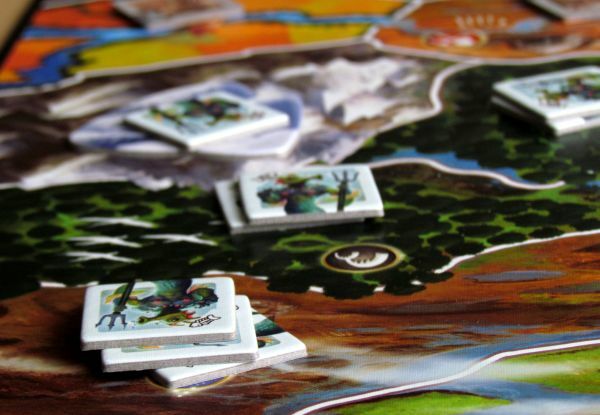 Small World is a great simple game, that should keep everyone entertained. Players in the course of game take place as leaders of several civilizations. That is its greatest advantage and charm, because the game is constantly changing as is the military situation of the players. And each civilization needs specific tactics, so you have to change your play multiple times during the match. 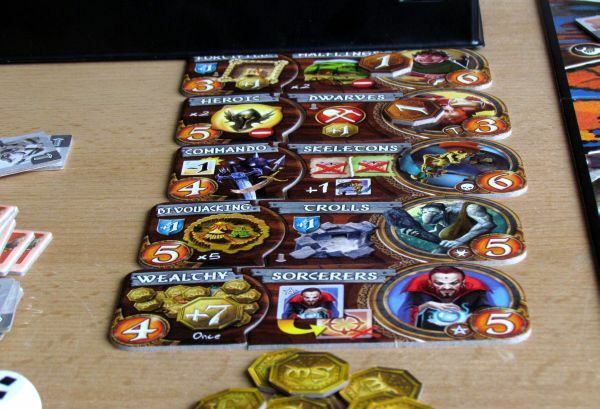 Except the races exchange, the game brings also great variability among different batches, because the combination of races and their skills will almost always be unique, when we count their numbers and amount of possible combinations (14 races + 20 properties). And you also have to adapt your choices accordingly, when you decide, which race to take under your wing this time. Most important for the whole game is to correctly estimate, when to send your folks into decline and take off to the hills with new wards. Only this way you can control the most territory in the world of Small World and succeed as a leader. Although the game is basically a bloody conflict between civilizations, it is surprisingly suitable for all players. Children over ten years of age will enjoy its simplicity as well as older players. Awesome processing by Miguel Coimbra helps this agenda really well. Battles in the Small World are fast and furious and catch your breath, as the influence of players come and goes as waves of the sea. 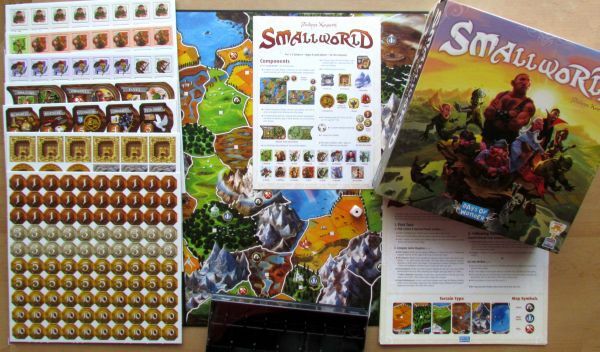 Small World is telling a story of simple concept reaching the whole world. At the beginning, you can deal with the problem, how to learn all those races and their abilities. Fortunately, all the cards contain clear and simple symbols, all of which can be easily understood once you know, how the game is played. It is important to have an overview of what races could still hide in drawing deck, because all already played nations are visibly distributed around the table. You can adjust your strategy accordingly and wait for your favorites. The decision, whether the choice of a new civilization is worth sacrificing a few victory points, is sometimes very difficult and you need to follow your instincts. 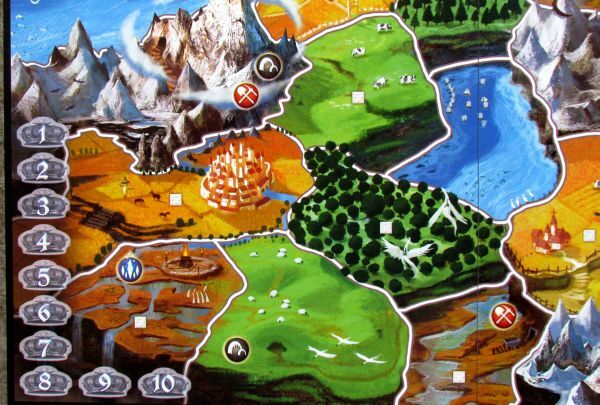 You must play by instinct also in the game, because if someone will try to play Small World only logical reasoning and planning, you will lose dozens of valuable minutes, when you could be having fun instead. So thoughtful attention to the choosing of opponents! 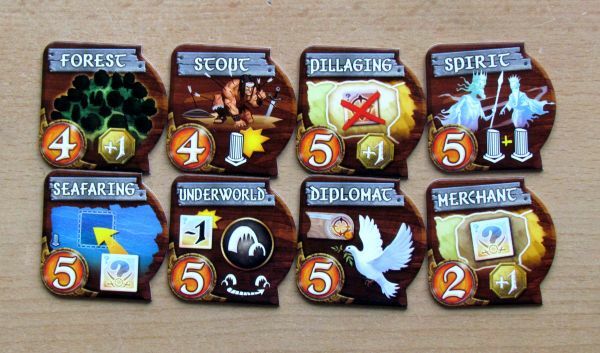 Game boards come in four variants, for each number of players is other world. This makes it an excellent game for all players’ numbers, although every count is little bit different in taste. In the duel of two players, both of them build a base, from which they set out on robberies. And when we gradually add players, the game leans towards really merciless destruction of everything in nation path. But there is still plenty of tactical options on the board itself, that can be used unobtrusively, like fortified underground tunnels or mountains. Every detail can lead to a change in dominance. And when one player loses momentum with its civilization, it is often too late to successfully restart his engine with another. The system of filling boxes is absolutely excellent. Players conquer first, but they can still regroup troops in the end of the turn to keep the lines of defense against the onslaught of the opponent’s forces. 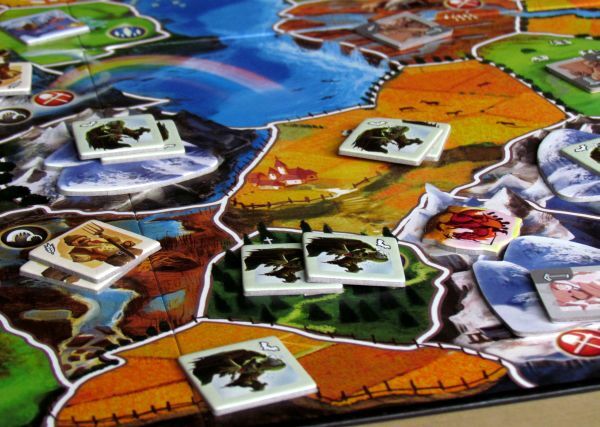 Overall, there is much more strategy hidden in Small World, than is obvious at first sight. Actually, the result of the game depends entirely on the capabilities and decisions of players. Chance is taking only a tiny spot at the moment, when conquering the last territory in your turn. Otherwise, all decisions are firmly bound to tactics. But if you should have problem with the reinforcement die, there is nothing easier, than to banish it from your sight and do not use it at all. Players do not have certainty about their position in match until the very end. Victory points are secretly gathered and because of the constant superiority changing sides, it can be hard to keep track of who got how many victory points. This way, everybody is interested in the game until the end, because they all have shot on victory. Philippe Keyaertes has created a valuable follower of his former game Vinci, which formed the basis for this game. 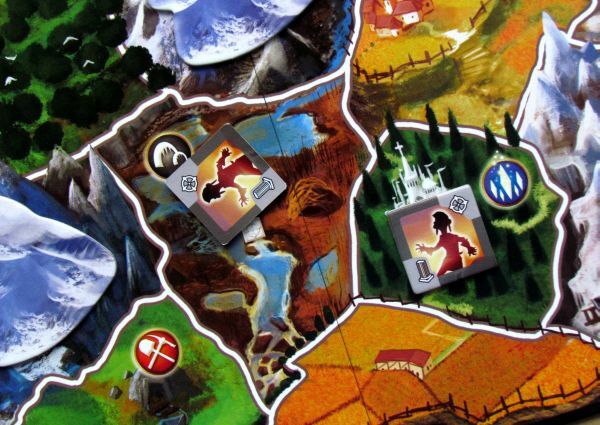 Small World has received a large number of extensions, and last year even a big brother called Small World Underground with more races and lands to conquer. You can find here a small and tiny imperfections. 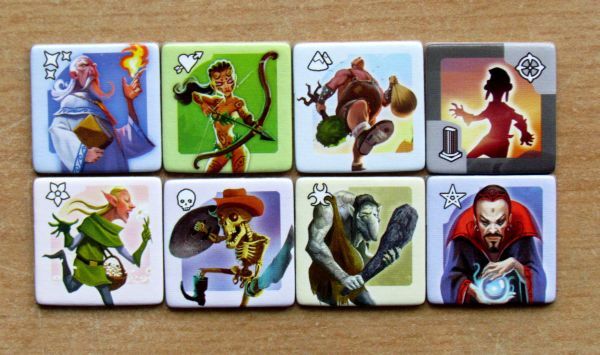 The bigger of them is, that the game sometimes lacks transparency – lots of colored tokens in a colorful world easily blends in. You can overlook some of your tokens while counting and if you are not playing with fair opponents, you lose some points just like that. 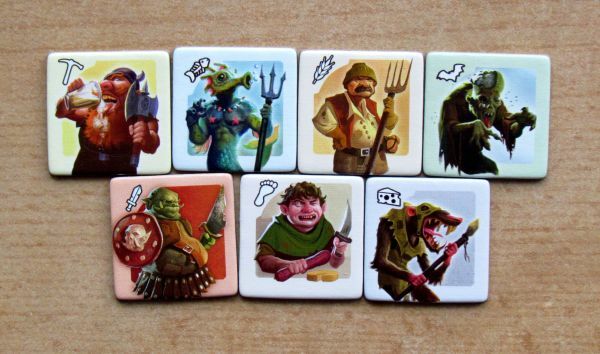 Also shuffling of the race tiles is less pleasant, and it could be easily replaced by drawing from some bag. Last criticism fall on the luxury races tray. Yes, everything is great and organized, when tokens are just laying inside. But as soon as you start to draw them out, you run into troubles and futile fight begins. Small compartments are so precise, that if one of tokens slips by accident and flips on the bottom, its very difficult to get it out. And finding the appropriate race is not easy as well, and you should label your tray with races names. 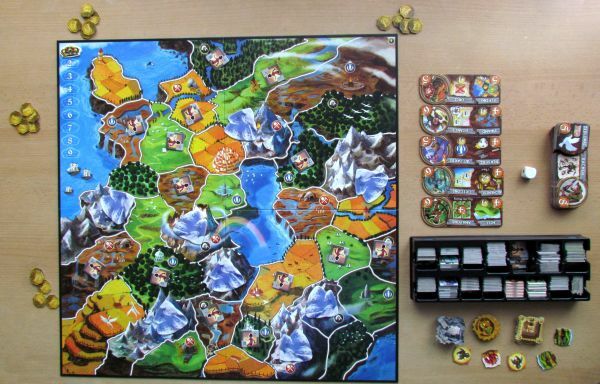 Board game Small World is simply perfect buy for all players. 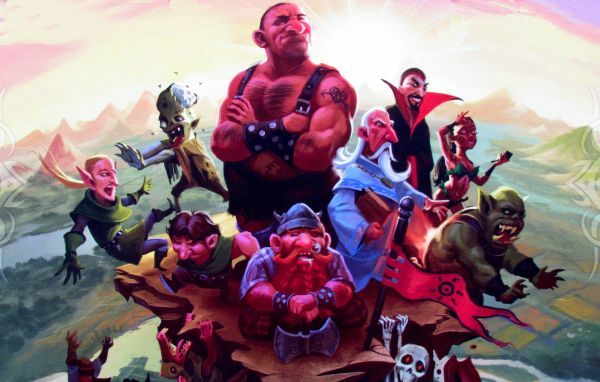 The game is fast-paced, constantly changing and there is no obvious winner until the end. 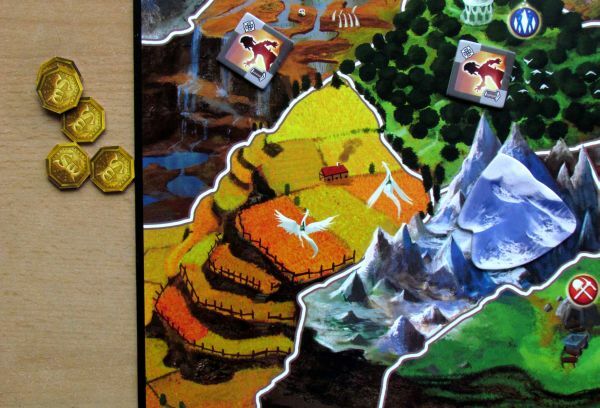 Small World has all the ingredients, which make a good game perfect and should not be missing in any collection of a board games fan. 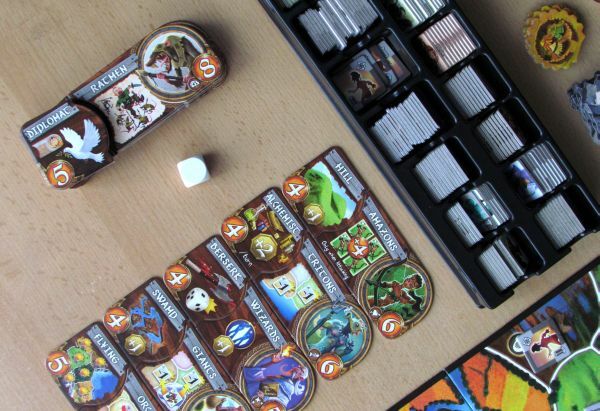 Its rules explain in a few minutes and it intrigues almost everybody with its looks and playability. 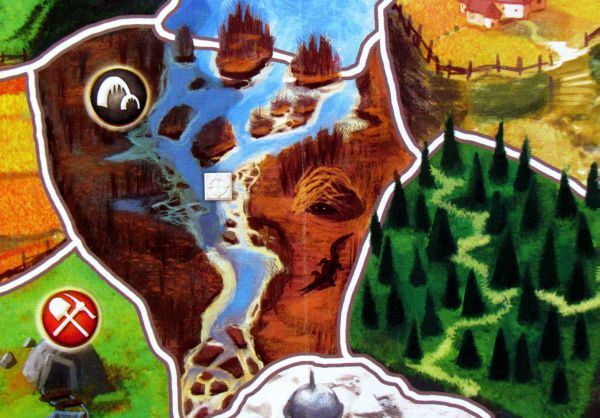 Small World is surprisingly simple and yet great game, which can gain attention of every player. During one match, you will get a chance to lead several nations to prosperity. And they can have different abilities, that aid you in your quest. A which player has controlled the most of locations, will become winner. But the winner is not known until the end of the game. You might get a little upset, when taking tokens out of the tray or when you are trying to count the tokens, which seem to fade away on the colorful board. It all plays well and quite fast. 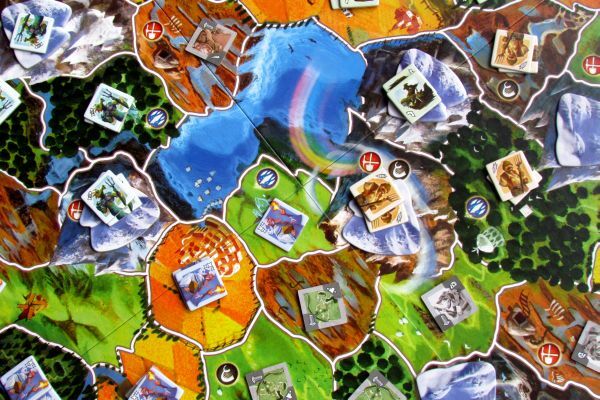 Small World is precisely one of those games, that should not be missing in and collection. 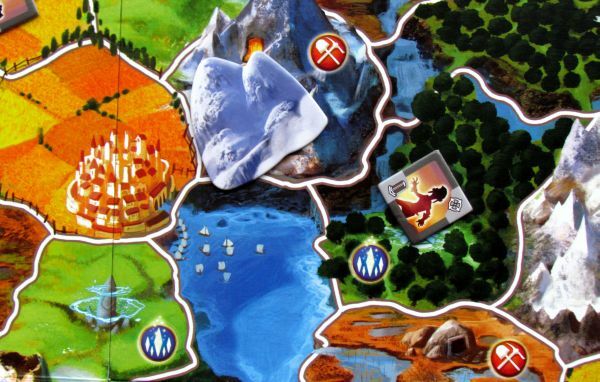 With match of Small World, you will not offend an experience player and you will please the less familiar. Simply a game for everyone..